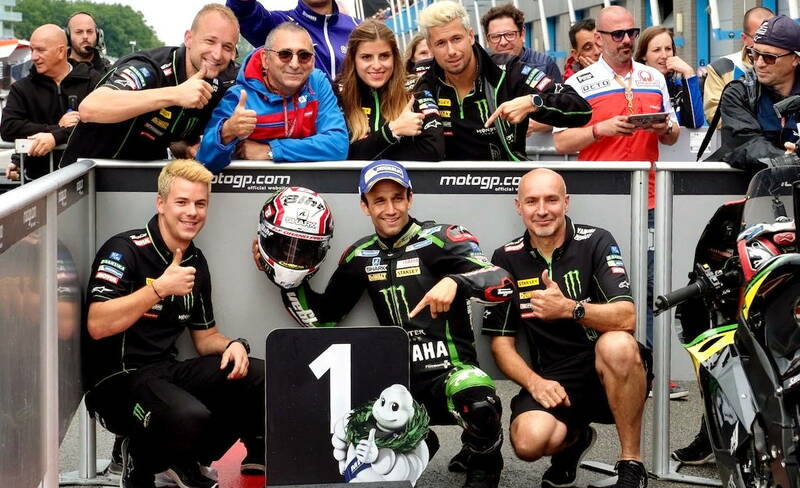 Rookie phenom Johann Zarco (Yamaha) took his first MotoGP pole position during qualifying earlier today for the Assen MotoGP race. Tomorrow, Zarco will line-up on pole with Marc Marquez (Honda) and Danilo Petrucci (Ducati) beside him on the front row. It rained at Assen today, and qualifying times were nearly 15 seconds slower than the times set in dry practice yesterday. Tomorrow’s weather forecast indicates the race will likely be on a dry track. Points leader Maverick Viñales (Yamaha) was only able to qualify in 11th position and will line-up on row 4 for the race. Follow this link to the full qualifying results. As promised, the 2017 MotoGP season is among the best ever. Four top riders, all worthy of the crown, separated by 11 points! MAHveluz! Re. Zarco: yes, he lead for much of the race, but his soft/soft tires did not give him as big a lead as hoped, and caused him to quickly fade to 4th by the time rain drops appeared, and he pulled in for rain tires. If it pours, he’s virtually guaranteed #1 because he was first to swap. Unfortunately the rain quickly dried, so he finished 14th. No idea how his pit lane speeding violation affects his points. But again, because his tires were so worn, if he did not switch, the net difference is nil, maybe a 10th, maybe worse than 14th. On the whole, a reasonable gamble. So happy for Dovi and Team Ducati. Hoping Maverick gets it together in Germany. Whatever was the setup difficulty for Maverick, his Italian teammate VR46 did not suffer from it! One last item: the high res slow mo of three riders through the chicane (head on angle) was nothing short of stupendous. Seeing MM’s front wheel rise of the track at the momentary point of full vertical was shockingly fun. The suspension on those bikes is beyond comprehension. It’s almost as if the bikes are immune to physical forces. Yamaha has to be pretty happy with their MotoGP program. Aside: A really great interview with Pedrosa. I’ve been kind of warming to him for (to me) kind of stepping up recently. Now, reading this, I think he has a great attitude, and puts stuff very well. Me too (warming to DP). Thanks for the link. Is he the smallest pilot on the grid? Touche’. I knew something was up with Zarco, and you nailed it. Put an image of Cal Crutchlow next to an image of Britain’s exemplary actor Kenneth Branaugh at similar age. Doppelgangers!